I really don’t make muffins often because I kind of resent the fact that they parade around like a legit breakfast when they’re really just a cupcake that you eat in the morning. Fakers! Anyway, I made these “apology” Triple Berry Oat Muffins this week and I have to admit, they were really damn good! What’s an apology muffin? That’s when your dog eats your friend’s muffin and leaves him without breakfast the next morning. Bad girl. 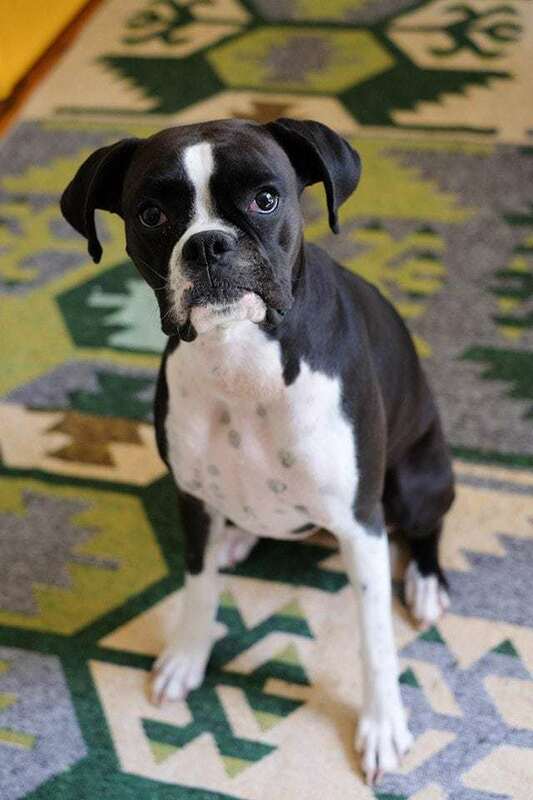 And since the dog can’t say sorry herself (she didn’t even throw any puppy eyes! 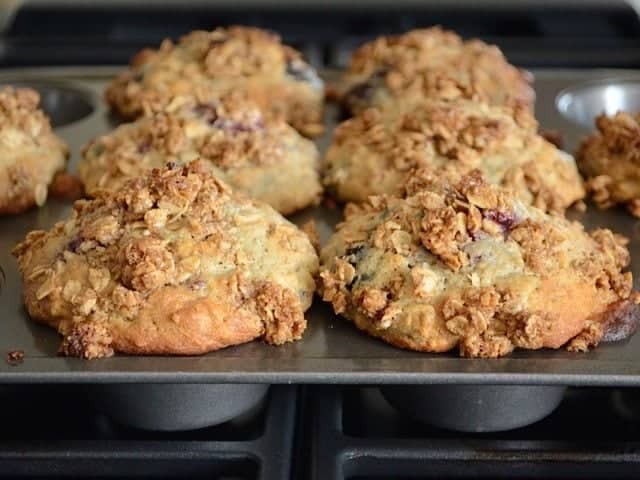 ), I baked a whole batch of Triple Berry Oat Muffins to make up for the one she ate. 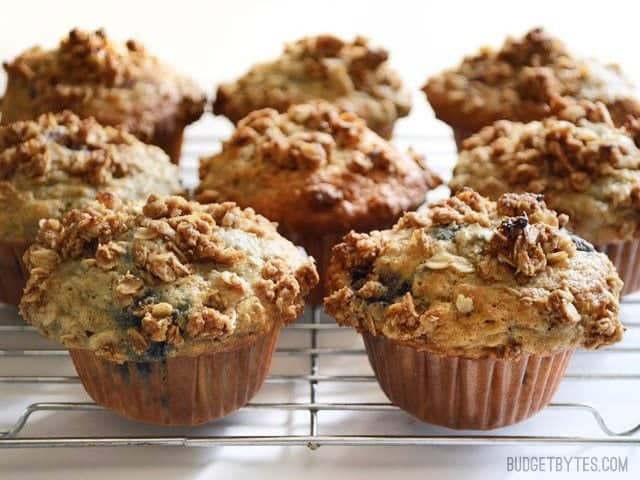 I wanted to make these muffins resemble the big delicious muffins that you buy from a bakery (like the one my dog ate), but try to sneak in at least a little something healthy. I used King Arthur Flour’s basic muffin recipe, but subbed in rolled oats, as per their notes, and some frozen berries that I had stashed in my freezer. I was at the very end of my all-purpose flour, so I used a 1/4 cup whole wheat flour to make up for what I was missing. And hey, that’s more fiber! Lastly, I added a touch of cinnamon to the batter, and made a delicious cinnamon-oat crumble topping. Yaasssss. 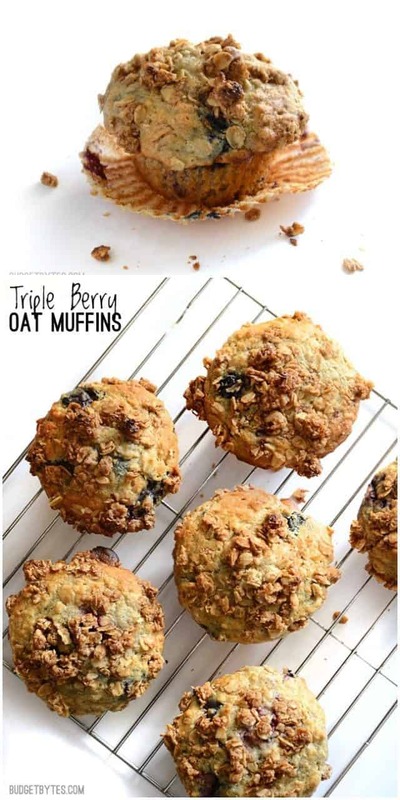 These Triple Berry Oat Muffins really were awesome. The King Arthur formula really is great and produces a big, moist, and tender muffin. We’ve been eating them all week and my dog, Zoe, almost snatched one of these for herself again (she’s a muffin maniac!). I can’t wait to experiment with different flavors and add-ins. Next up, pumpkin? If you don’t have a friend and a dog to help you eat the whole batch, muffins freeze really well. Just make sure they are fully cooled before wrapping them tightly in plastic and then zipping them up in a freezer bag. 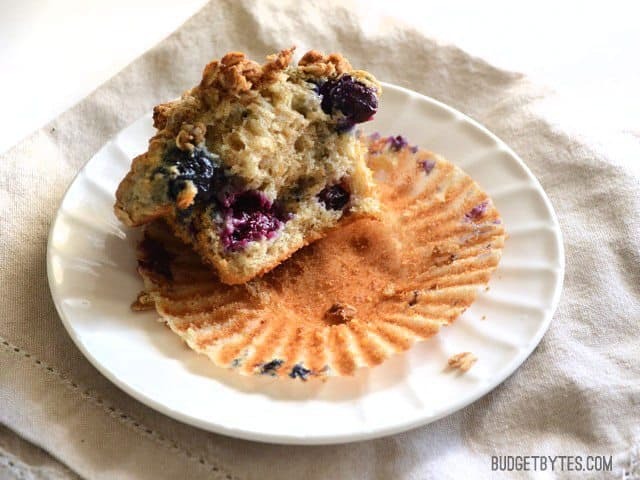 The frozen muffins thaw fairly quickly at room temperature or can be reheated briefly in the microwave. 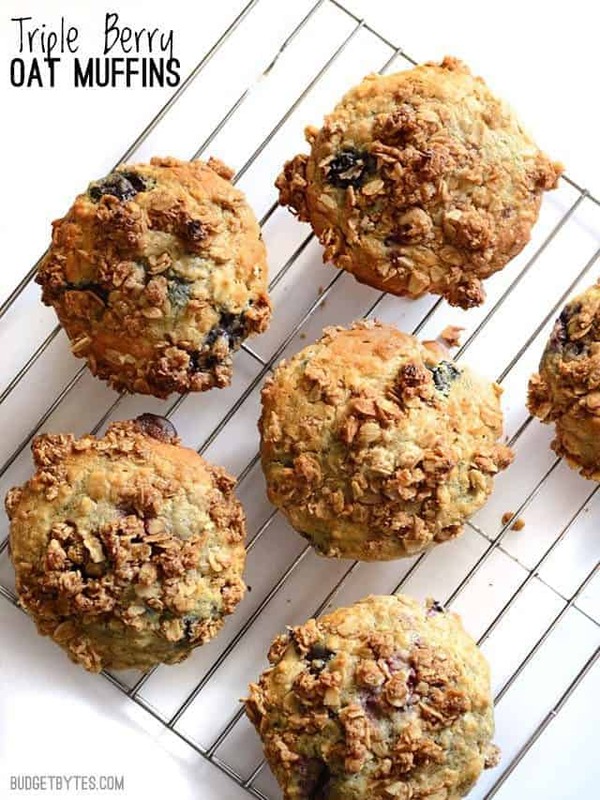 These big, moist, and fluffy Triple Berry Oat Muffins are a real treat for breakfast and boast the goodness of rolled oats. Prepare the oat crumble topping first, so it's ready to go on the muffins as soon as they're mixed. 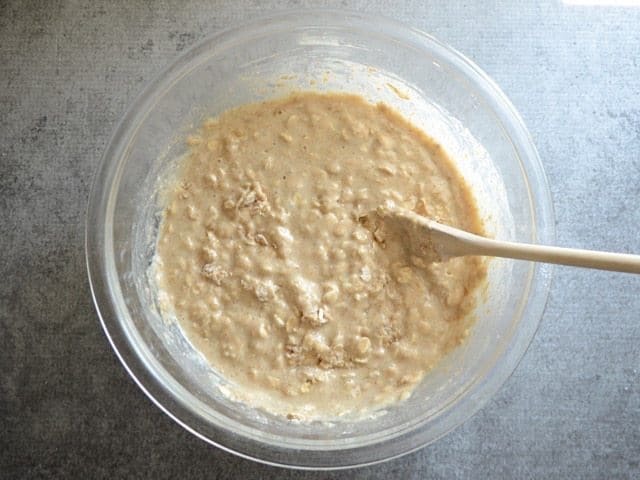 In a small bowl, combine the oats, butter, brown sugar, and cinnamon. 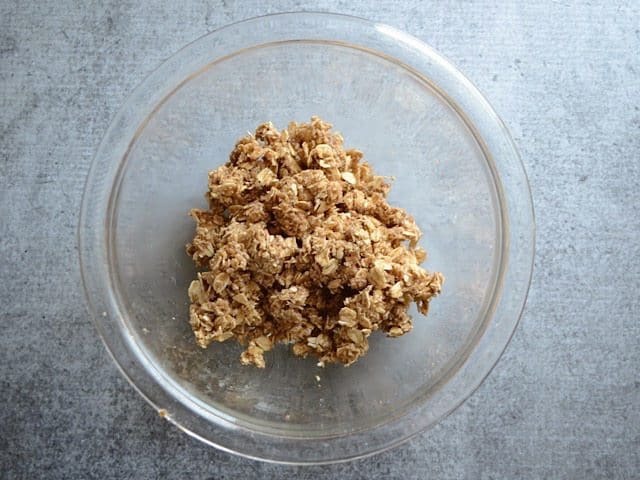 Use your hands to massage the oats, brown sugar, and cinnamon, into the butter until it's evenly combined and clumpy. Refrigerate the mixture until you're ready to top the muffins. Preheat the oven to 500 degrees. In a large bowl, combine the all-purpose and whole wheat flours, oats, brown sugar, white sugar, salt, baking powder, and cinnamon. Stir well. In a separate bowl, whisk together the milk, eggs, and oil. Pour the whisked wet ingredients into the bowl with the dry ingredients. Stir just until they are combined, it doesn't need to be perfectly mixed. There may still be clumps and a few dry spots, but it's important to avoid over mixing. Add the frozen berries to the mixture and gently fold in. Again, avoid over mixing because the berry juice will turn the muffins blueish grey. Line eight muffin tin cups with paper liners, then fill each one to the top with the muffin batter (use more cups if needed, just make sure to fill to the top). 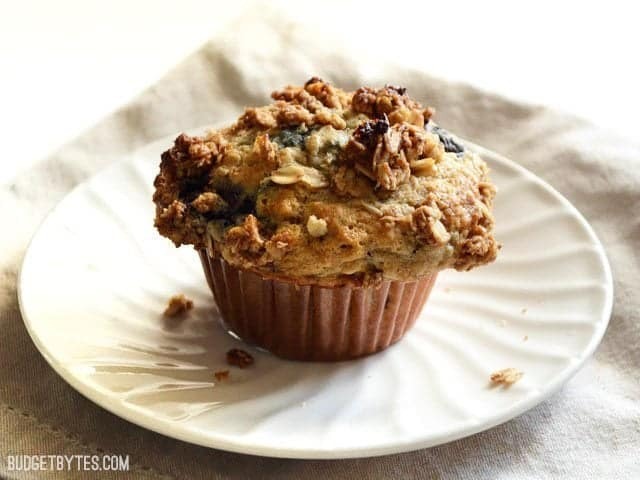 Sprinkle the prepared oat crumble topping onto each muffin. Transfer the muffin tin to the oven and immediately turn the heat down to 400 degrees. Bake for 22-25 minutes, or until the muffins have risen into peaks, have cracked slightly, and are deep golden brown on top. Remove the muffins from the oven and the muffin tin (use a knife to loosen any parts that have spilled out over top) and allow them to cool. Make the oat crumble topping first so that it’s ready to go later. 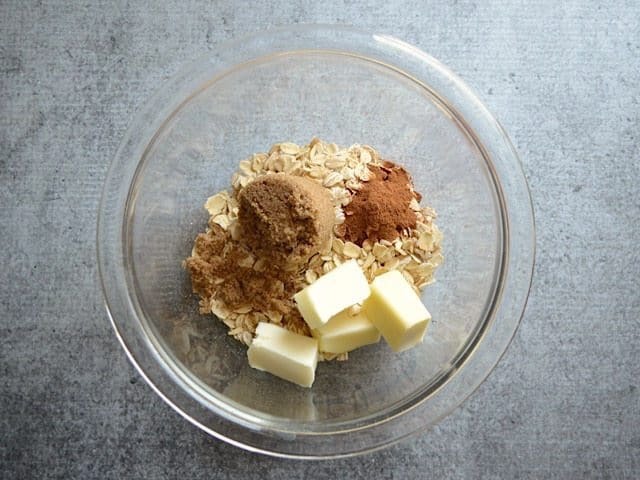 In a small bow, combine 1/2 cup rolled oats, 2 Tbsp chilled butter, 2 Tbsp brown sugar, and 1/4 tsp cinnamon. 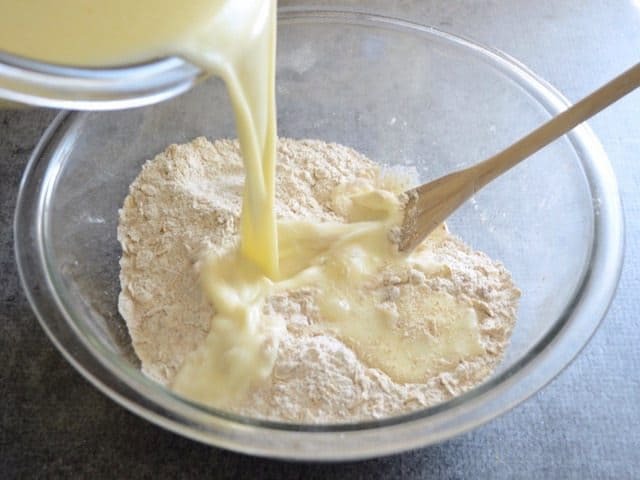 Massage the ingredients into the butter until it forms a well mixed “crumble” texture. Refrigerate the topping until it’s ready to go on the muffins. Begin preheating the oven to 500 degrees. 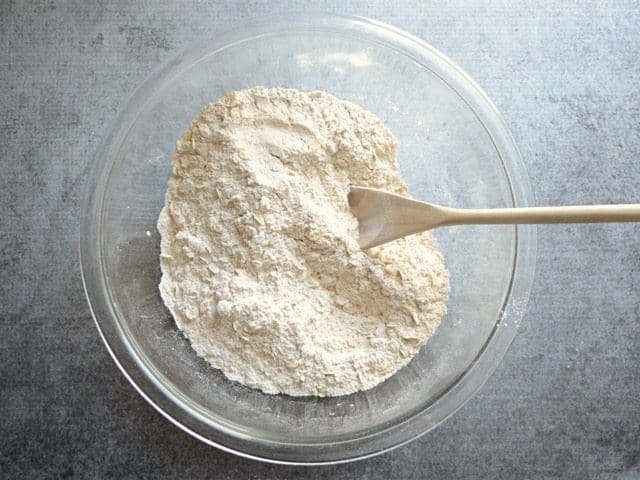 In a large bowl, combine 1 cup all-purpose flour, 1/4 cup whole wheat flour, 1 cup rolled oats, 1/4 cup brown sugar, 1/4 cup white sugar, 1/2 tsp salt, 1 Tbsp baking powder, and 1/4 tsp cinnamon. Mix these dry ingredients together really well. 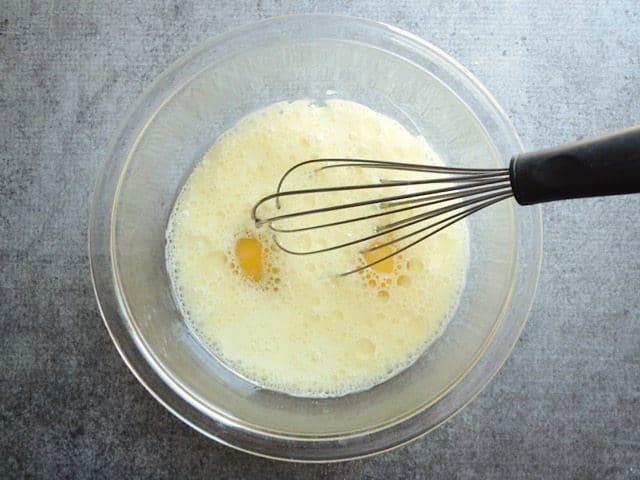 In a separate bow, whisk together 2 large eggs, 1 cup milk, and 1/4 cup vegetable or canola oil. Whisk until smooth. Pour the wet ingredients into the bowl of dry ingredients. Stir the two together JUST until they’re combined. It’s really important not to over mix here, so it’s okay if it’s lumpy and there are a couple dry spots left. You’ll stir just a bit more after adding the berries. 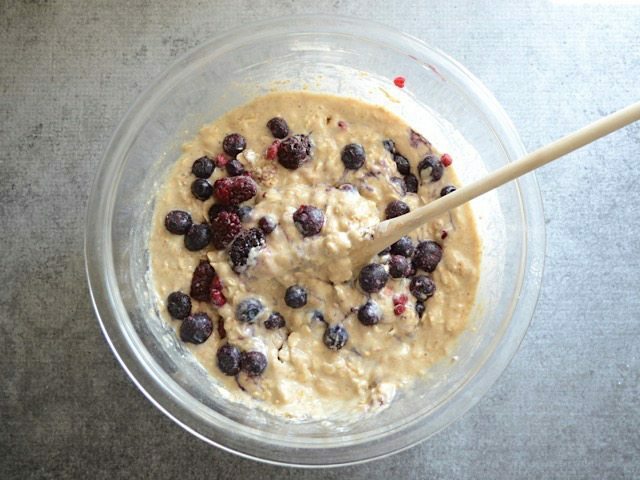 Add one cup frozen berries and gently fold them into the batter. Don’t stir too much because they’ll turn the batter blue. Also, keeping them frozen until you stir them in helps prevent the juice from spreading and turning the batter blue. Line about eight cups of a muffin tin with paper, then fill each one to the top with the muffin batter. Usually you only fill the cups of a muffin tin 3/4 full, but if you want a nice big crown on the muffin like they have at the bakeries, fill them to the top. Finally, top the muffins with the oat crumble mixture. Here’s the side view for reference, so you can see how full they are. Transfer the muffin tin to the oven, turn the heat down to 400, then let them bake for 22-25 minutes. Or until they’ve risen into nice rounded muffins, the tops have just a couple cracks, and they’re deeply golden brown. YUM. 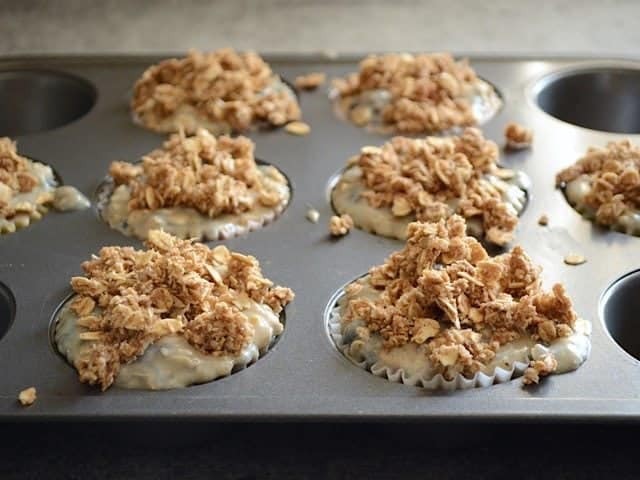 Remove them from the muffin tin to let them cool. 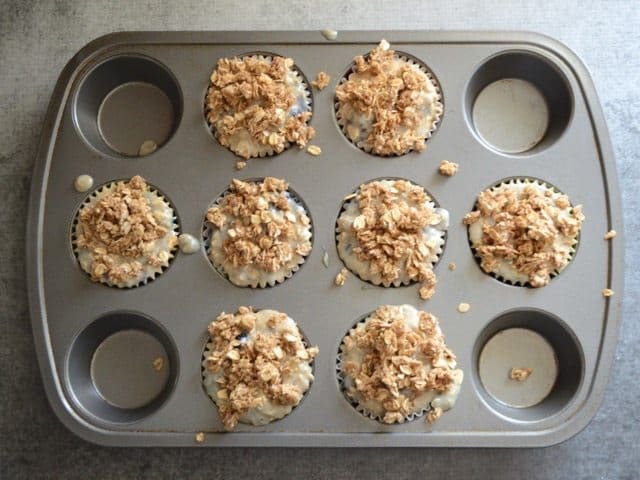 It helps to use a knife to gently loosen the muffins where they’ve spilled over top. And then once they’re coooool, peel and enjoy! I’ve made these in the past, I wanted an easy recipe to make with my 3 year old that didn’t have butter in it because we’d ran out and I remembered this recipe. Because we had no butter I didn’t add the crumble topping so upped the cinnamon and added a tsp of vanilla. Have gone down well with my 3 year old and 15 month olds. Not a crumb was left. Awesome recipe, turbed out great. Thank you! Why do we preheat the oven to 500 and bring it down to 400? Is it to prevent loss of heat? That way you get a sudden burst of really hot air that helps them expand quickly, but then lowering the heat slows down the cooking a bit so the inside has time to heat up and cook through before the outside burns. These were quite good! I added a berry mix with sweet cherries and chopped them up and that was definitely a win. Yep, brown sugar has a lot more flavor than white sugar, so that could have been part of it. 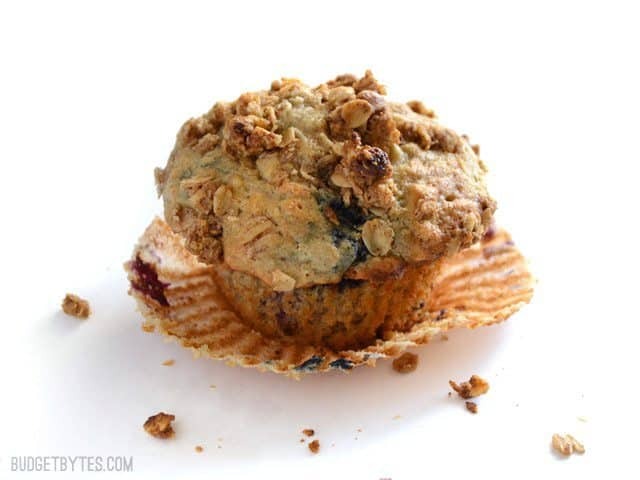 :) Brown sugar has molasses in it, which adds both moisture and flavor to the muffin batter. Mmmmm muffins. 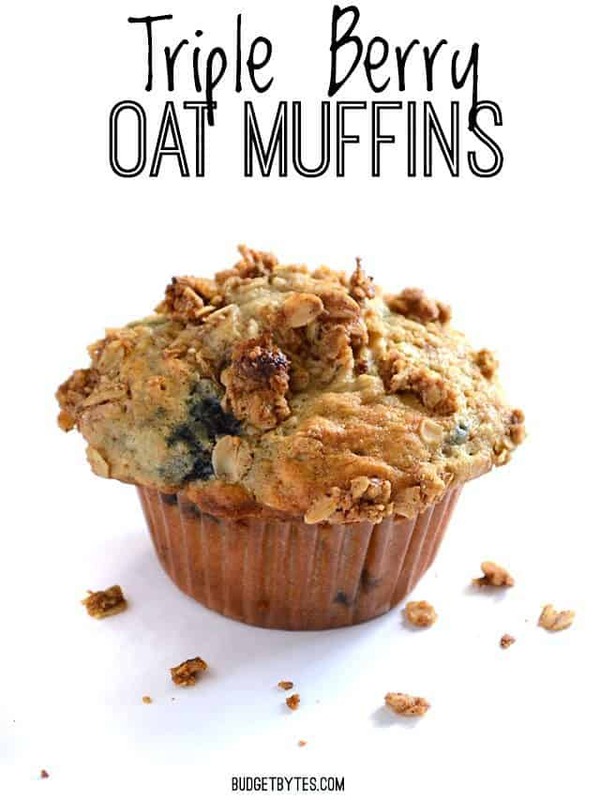 I usually eat chocolate chip and coffee cake muffins but this seems like a slightly healthier alternative. Thanks! Can I use buttermilk instead of regular milk? Potentially, but buttermilk is much more acidic than regular milk, so that may change the flavor and texture. I’d have to test it out to know exactly what effect it would have on the muffins. Can you make this recipe with rice flour or gluten free? I just stuck these in the oven and am crossing my fingers! I followed the recipe exactly (I’m no novice – I can actually bake muffins without a recipe for the most part), but this batter seems awfully runny!